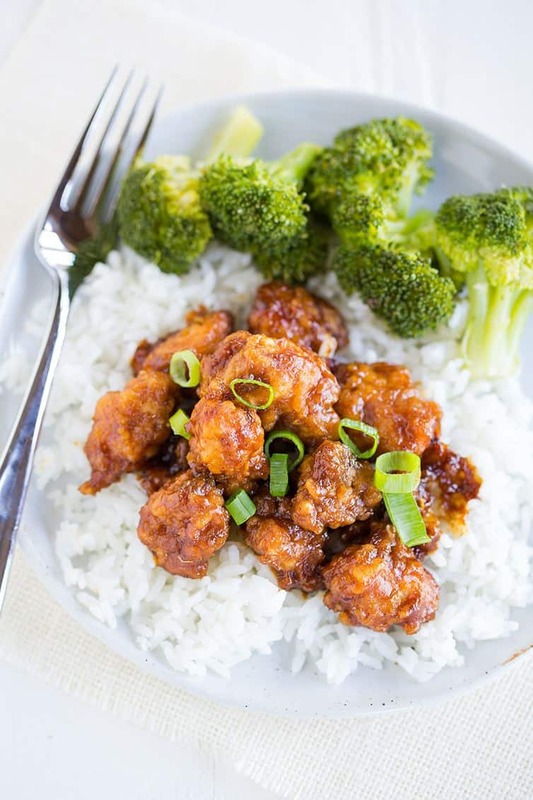 This homemade version of General Tso’s Chicken is the closest recreation I’ve ever found! 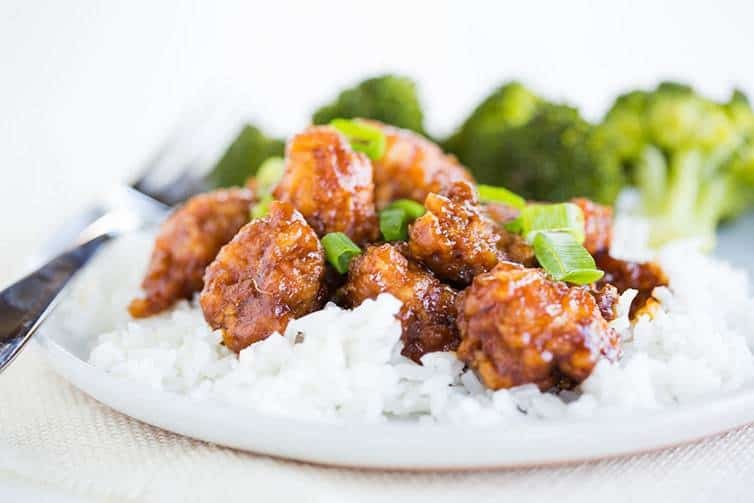 If this is one of your favorites when you order Chinese takeout, you HAVE to try it at home! It wasn’t until I started dating my husband that I really started to fall in love with Asian cuisine. He introduced me to Thai, sushi, and amazing Chinese takeout. Most college kids rely on Chinese take out to get them through cram sessions and heartache, but I was always more of a pizza girl. I leaned on Domino’s and the local favorites. I, of course, had tried Chinese before, but was never crazy about it. All of that changed when I started spending time at my husband’s place on the weekends. When he first mentioned ordering Chinese and I said that I had never found something I really liked, he said I had to get General Tso’s, and that I would love it. He knows me all too well, because I absolutely adored it. Between the crunchy, battered chicken, the thick sauce, and the generous amount of spice, I was completely smitten. It soon became my favorite take out option, and I found myself craving it. We had talked about trying to make it at home, but it took me a long time to find a recipe that I thought sounded authentic enough. This one absolutely nails it, and we both love, love, love it. I was most worried about the chicken breading having that characteristic thick, crunchy coating that is so typical of General Tso’s. That was definitely achieved, thanks to including just a little bit of the marinade in the dry batter ingredients. Genius! Everything else came together perfectly. As I cooked the sauce, I couldn’t believe how absolutely identical it smelled to the General Tso’s sauce I have come to know and love. Once everything was finished and we dug in, we hardly spoke a word, except to grunt and groan about how phenomenal the food was. And how much it really did taste like General Tso’s chicken. 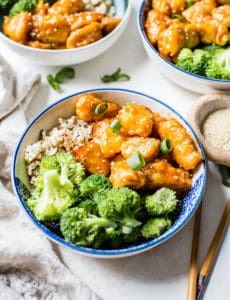 I like to serve this with simple white jasmine rice and steamed broccoli to replicate the takeout experience, and it’s absolutely delicious. If you’ve never used jasmine rice, you have to give it a try! The first time I made it, my husband asked what I did differently to the rice (nothing!) because it tasted so much better than “regular” rice. 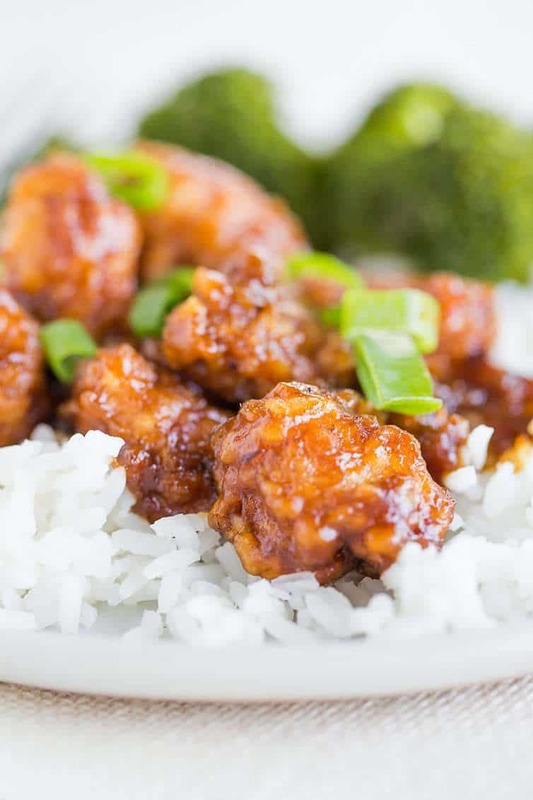 This is significantly easier than you might think and doesn’t involve too much prep time, so if you have a hankering for General Tso’s chicken and want to give it a try yourself, you cannot go wrong with this recipe! A homemade recipe for one of the most popular Chinese takeout dishes. Not as difficult as you would think and SO delicious! Make the Marinade: Whisk the hoisin sauce, vinegar, soy sauce, sugar, cornstarch, and water in a bowl. Of this mixture, place 6 tablespoons into a zip lock storage bag and add the chicken; seal and refrigerate for at least 30 minutes. Set aside the remaining marinade in the bowl. 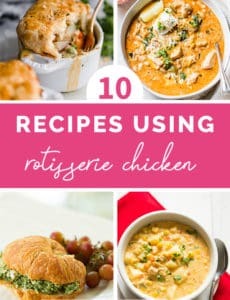 Make the Sauce: While the chicken is chilling in the marinade, heat the 1 tablespoon of vegetable oil in a large skillet over medium heat until shimmering. Sauté the garlic, ginger and red pepper flakes until fragrant. Add 2 cups of the hoisin marinade to the skillet and simmer, whisking constantly, until the mixture is dark brown and thickened. Remove from heat and cover to keep the sauce warm. Prepare the Coatings: Whisk the egg whites in a shallow dish until foamy; set aside. Combine the cornstarch, flour, baking soda, and remaining hoisin marinade in a second shallow dish; mix until it resembles coarse meal. Prepare the Chicken: Remove the chicken from the refrigerator and from the marinade. Pat the marinated chicken dry with paper towels. Toss half the chicken into the foamy egg whites until well coated, then dredge the chicken in the cornstarch mixture, pressing to adhere. Transfer the coated chicken to a plate and repeat with the remaining chicken. Cook the Chicken: Heat the oil in a Dutch oven over medium high heat until the oil registers 350 degrees. Fry half the chicken until golden brown, about 3 minutes, turning each piece halfway through cooking. Transfer the cooked chicken onto a paper towel lined plate to drain. Return the oil to 350 degrees before frying again. Repeat with the remaining chicken. Finish: Warm the sauce over medium heat until simmering. Turn off the heat and add the fried chicken pieces. Toss to coat and serve with sliced green onions to garnish, as well. White jasmine rice and steamed broccoli are favorite sides here! This recipe was originally published on April 16, 2012. This is the most delicious recipe. We make it every couple months for a treat. It’s a lot of work and a bit of a mess but so worth it every time. So Yummy! I had high hopes for this, but did not like the sauce at all. It just tasted like hoisin sauce chicken. Great recipe!! Made it tonight and it turned out very good. I had more chciken than it called for, so the final product was not as “saucy” as i like, but that was my bad.. Tasted very good though, will definitely make again! Made this for my family the other night and we loved it!! I can say it wasnt too easy or too hard, took a little over a hour to complete and tasted much better than some resurants ive been to. So thank you for sharing, this is now a new dish on our familys’ menu. I finally made this tonight. I cannot day enough how GOOD it is. I’m not typically a General Tso’s fan and made this more for my husband but I can’t stop eating it. Next time I’ll add a touch more crush red pepper but I’m in love. Amazing recipe Michelle!!! Awesome recipe. Thanks for this. I attempted this last night but I messed up the breading somehow. Instead of coarse meal it was more like wet cement that stuck to everything besides the chicken. What did I do wrong? The flavor was amazing though so I want to try again. Hi Jessica, Hmmmm I’m wondering if too much liquid was used? It sounds like it turned to a paste instead of a shaggy mixture. I would just double check your amounts of liquid. 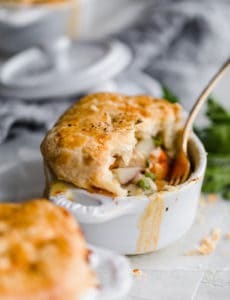 I’ve made this recipe numerous times and is a huge crowd pleaser in our house, for family and guests a like. When we moved to Calgary, Alberta General Tso’s Chicken is not a common take out food option and no one seemed to be able to get it right. This is a must try!!! Question, comment and review: I made this tonight…. my concern is two fold….. are the directions correct re the amount of cornstarch? 1.5 CUPS? wow!!! Also, I did not even have the 2 cups of the hoisin marinade to add to the skillet, and certainly nothing left over to add to the cornstarch/flour combo…. what a mess…. I need some help… I followed exactly…. Hi Phyllis, Yes, those measurements are correct. Hmmm I’m not sure how you couldn’t have any leftover, I’ve made this tons of times and always have more of the sauce to add to the flour mixture. Hi Bia, You could use another mild vinegar like apple cider vinegar. Love General Tso’s Chicken. The restaurant that had our favorite closed down. Will have to try your recipe.